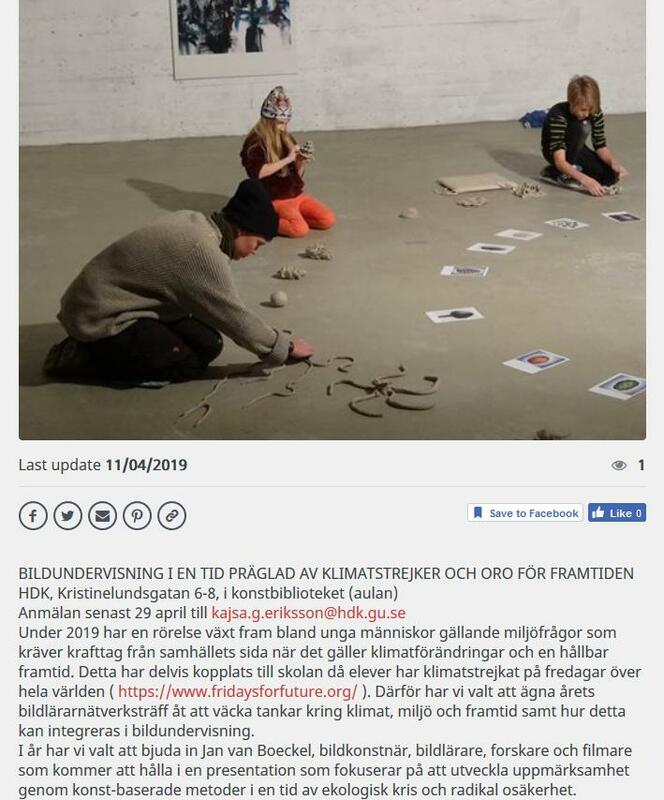 May 2: Keynote and workshop at the network meeting of art teachers at HDK Gothenburg, Sweden, on Art education in a time of climate strikes and fear for the future. March 20: Keynote and workshop: Being present in the present to what presents itself. At Symposium Global Challenges – Rethinking Education? of the Nordic Summer University (study circle Learning and Bildung in time of Globalisation), 19-21 March 2019, University of Bergen, Norway. 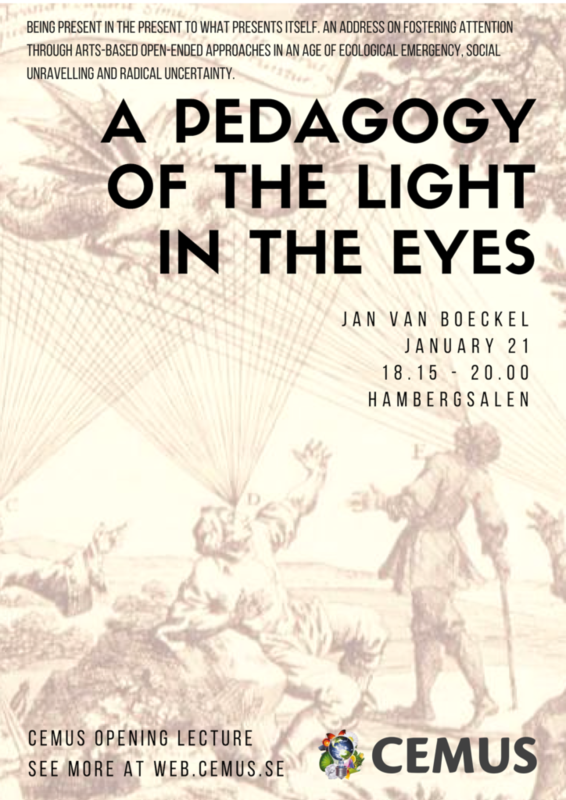 January: CEMUS Opening Lecture: “A pedagogy of the light in the eyes” Being present in the present to what presents itself. An address on fostering attention through arts-based open-ended approaches in an age of ecological emergency, social unravelling and radical uncertainty. April: Presentation of paper “Fostering Agility Through Art,” together with Jeroen Lutters (ArtEZ, Netherlands), at the Radical Relevances conference at Aalto University, Finland (25-27 April, 2018). May: Lecture and hands-on workshop at Wageningen University, the Netherlands, as part of the course Environmental Education and Learning for Sustainability. 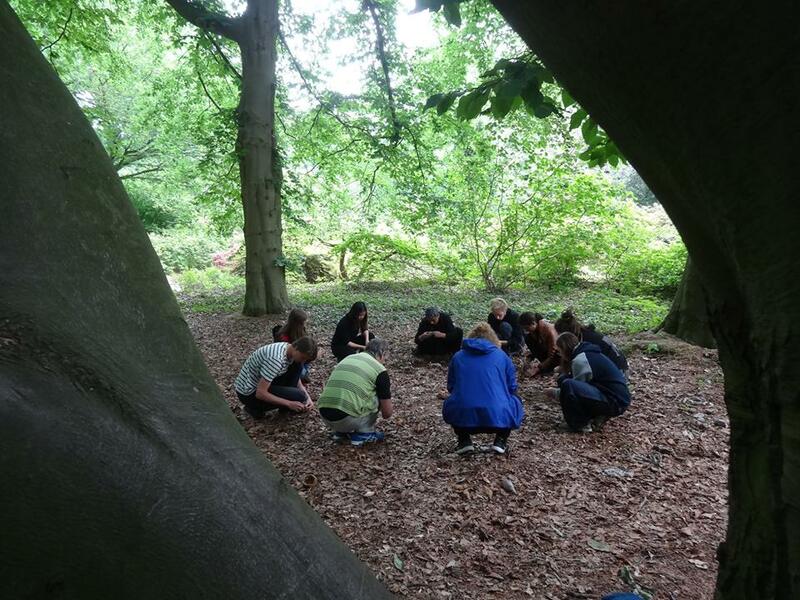 This course enables students to actively engage with critical issues in designing an appropriate environmental and sustainability education programme using a variety of learning and community engagement approaches. 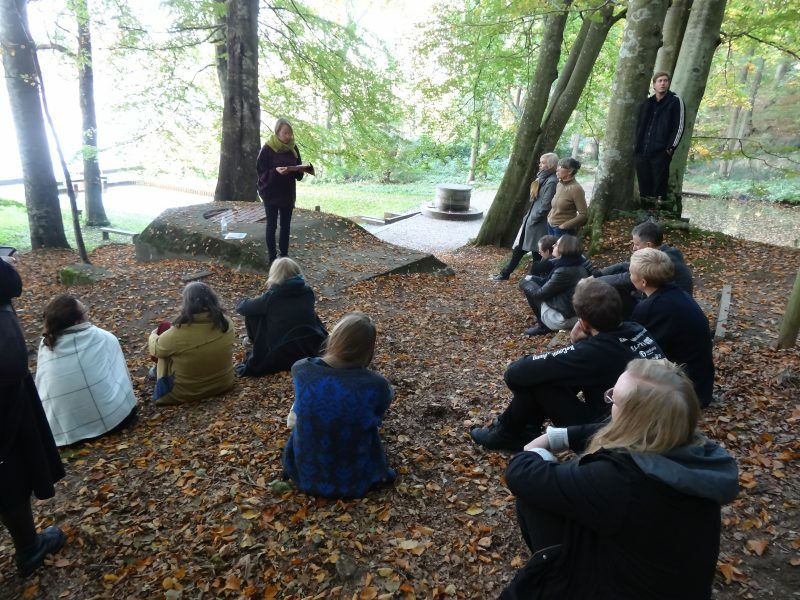 Oct.: Lecture as part of the symposium State of the Art – A multidisciplinary collaboration facing the Anthropocene in Silkeborg (10-13 Oct., 2018), Denmark. 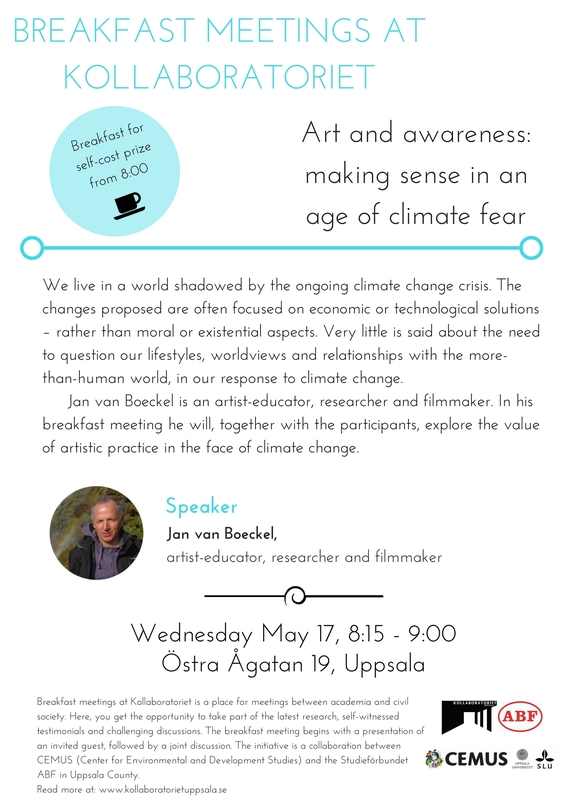 May: Breakfast presentation Art & awareness: making sense in an age of climate fear at the Bloom Sustainability festival in Uppsala, Sweden. 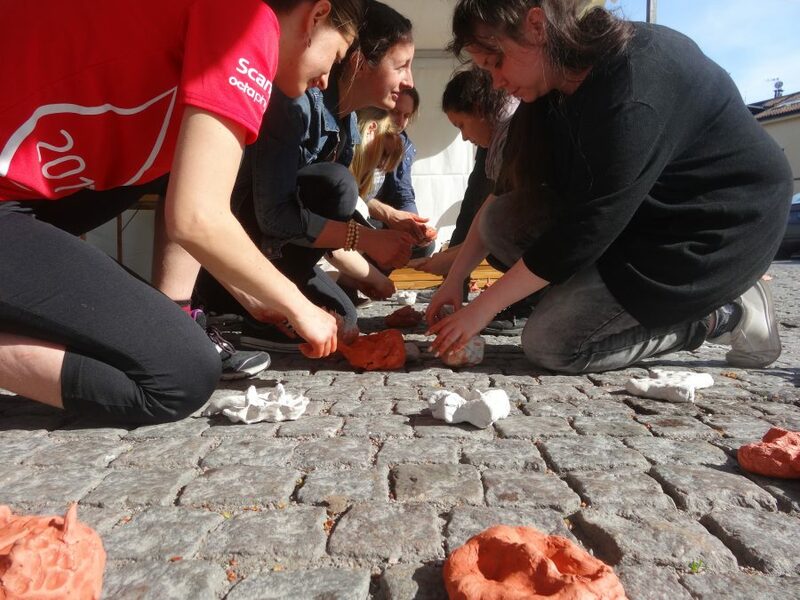 Workshop with clay (“Missing links”) on the Gamla Torget town square of Uppsala. Aug.: Presentation “Art & awareness, making sense in an age of climate fear,” and clay workshop “the gesture of the receiving hand.” At Art & Design Practice programme of University College Roosevelt in Middelburg, Netherlands. Nov.: Workshop Wildpainting at conference on “Green pedagogy” at Groeneveld Castle, Baarn, The Netherlands. The conference highlighted the importance of nature in education and health care. Nov.: Presentation “Art & awareness, making sense in an age of climate fear,” University College of Southeast Norway (HSN), Notodden, Norway. Workshops with 36 students in art education & design. Nov.: Lecture and workshops in Bø, Norway, at invitation of Bærekraftige liv i Bø (Transition Town Bø). 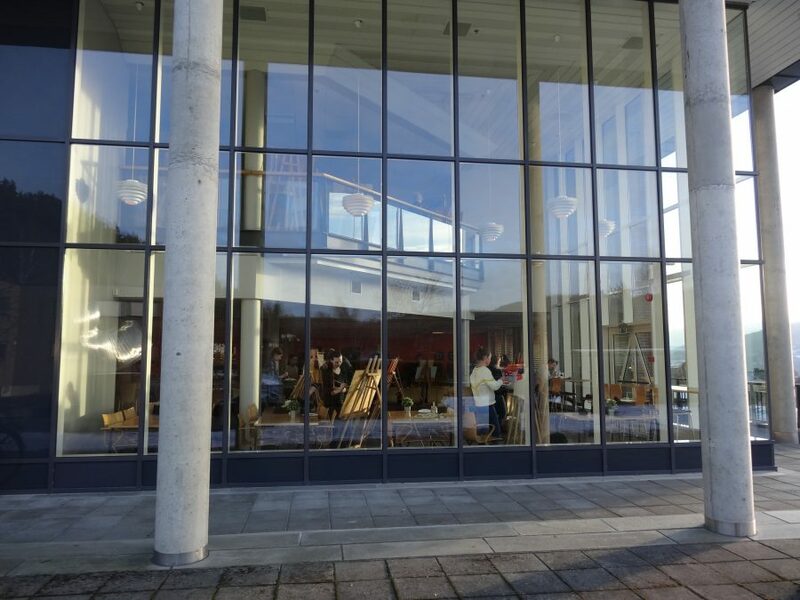 Nov.: Lecture “The relevance of arts-based practice and connecting to nature in an age of climate fear” at NMBU, Ås, Norway, at the Teacher Education in Natural Sciences program. Jan.: Presentation on arts-based autoethnography and interpretative phenomenological analysis (as part of my doctoral research) at ArtEZ International Research School of Arts and Cultural Education (AIR), in Arnhem, Netherlands. Feb.: Facilitation of workshops and participation in seminar of the BERA Research Commission Project “Reviewing the potential and challenges of developing STEAM education through creative pedagogies for 21st century learning”, in Aberdeen, Scotland. May: Facilitation of art workshop as part of the seminar “Knowing from the Inside Kitchen,” of which the theme was: “An Epistemology of Attention – Exploring the Curriculum.”The KFI Kitchen is a ERC Research project led by anthropologist Tim Ingold at the University of Aberdeen. In this week-long workshop at Comrie Croft in Perthshire we investigated what it means to teach. A number of approaches and perspectives emerged from a broad range of disciplines, with formal presentations alongside hands-on activities designed to shed light on and demonstrate what might be possible for a university considered otherwise. May: Lecture and workshop facilitation on the theme of art and environmental education at Wageningen University and Research Centre in The Netherlands, as part of the course Environmental Education and Learning for Sustainability. Sept.: Facilitation of a break-out session on imagination and storied sensorial memory of landscape and place at Green Grounds for Health and Learning (5th International School Grounds Conference), in Lund, Sweden. Oct.: Open Lecture at Estonian Academy of Arts in Tallinn: “Perspectives on art education in today’s global economy.” Together withTomaž Zupančič, Professor at the Faculty of Education, University in Maribor, Slovenia. Conversation about the interfaces of art, art education and economy. Nov.: Lecture with the theme Researching self-facilitated practices in arts-based environmental education: A report on challenges in performing arts-based autoethnographic explorations at the conference Refl(a)cting on Arts, Design and Art Education at ArtEZ University of the Arts, The Netherlands. In response, one of the co-presenters, Jochem Naafs, wrote a touching poem, in which he very keenly expressed what my presentation was about – while simultaneously adding new layers of meaning. 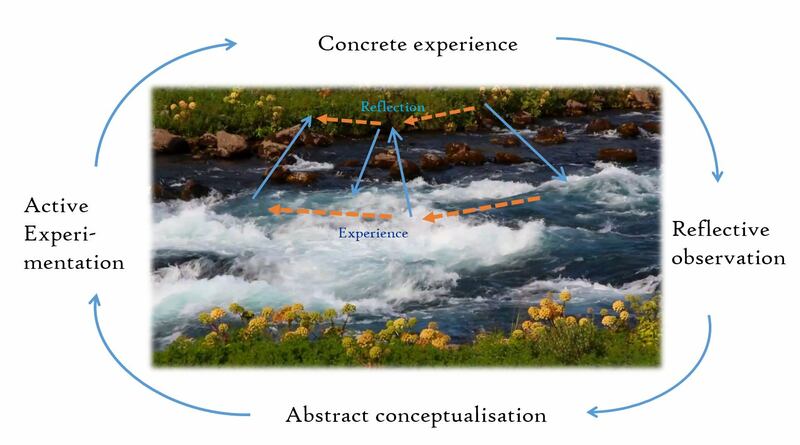 May: Paper presentation, “Angels talking back and new organs of perception: Art making and intentionality in nature experience,” at NORDIK conference (Art History) in Reykjavik, Iceland. May: Paper presentation, “Angels talking back and new organs of perception: Art making and intentionality in nature experience,” at conference “Culture(s) in Sustainable Futures”, in Helsinki, Finland. May: Lecture and workshop as part of MA study program “Applied Environmental Education,” at Life Sciences Wageningen University, The Netherlands. 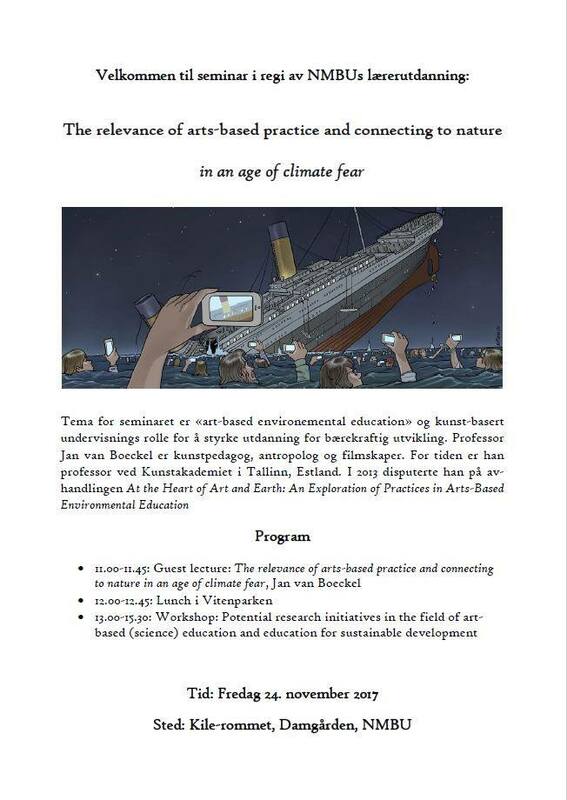 Nov.: Lecture on my research in arts-based environmental education, at conference Jubileum & Visioner. Høgskolen i Telemark, Notodden, Norway. Nov.: Open lecture: “From education for sustainable development to sustainable education – what is the role of art?” At Section for Learning and Teacher Education, IMT, NMBU, Ås, Norway. Nov.: Lecture on my doctorate research at Metodsymposiet, Gävle University College, Gävle, Sweden. Feb.: Presentation on arts-based environmental education practices in Europe at NAEA Pre-conference: “Earth Education: Art Education as if the Environment Matters,” Education Center at the Rubin Museum of Art, New York. June: Lecture and paper presentation on research findings as part of PhD study “At the Heart of Art and Earth,” at Conference Onderzoek in Cultuureducatie at Erasmus University, Rotterdam, The Netherlands. Feb.: Presentation of several workshops at “2011 Freiburg Forum on Environmental Governance: Inspiring Change Towards a Green Economy,” in Freiburg, Germany. Feb.: Lecture and workshop presentation at Art and Ecology Seminar at Oslo National Academy of the Arts, in Norway. April: Lecture on Konst och omställning (“Art and transition”) at Gävle Konstcentrum in Gävle, and workshops with art students of Högskolan i Gävle, in Sweden. Nov.: Lecture “Angels talking back and new organs of perception: Art making and intentionality in nature experience,” presented at the “Shorelines International Symposium on Creativity, Place and Wellbeing” in Maclaurin Galleries, Ayr, Scotland. Febr. : Lecture at Seminar Konst för ett ekologiskt hållbart samhälle (“Art for an ecologically sustainable society”), Wij Trädgårdar, Ockelbo, Sweden. May: Lecture at transdisciplinary workshop “Aesth/Ethics in Environmental Change”, Hiddensee, Germany. June: Lecture at “TRACES: Sustainable Art Education,” the InSEA conference in Rovaniemi, Finland. Oct.: Facilitation of five-hour long session “A Dialogue on Beauty,” with 15 participants, amongst others: F. David Peat, Alan Boldon, Pirkko Pohjakallio, and Henrik Tschudi. As part of the three week long program “Gentle Actions” in Oslo, Norway. Oct.: Presentation of the opening seminar “The Art of Looking Sideways: Reflections on the Art of Actions.” As part of “Gentle Actions,” Oslo, Norway. 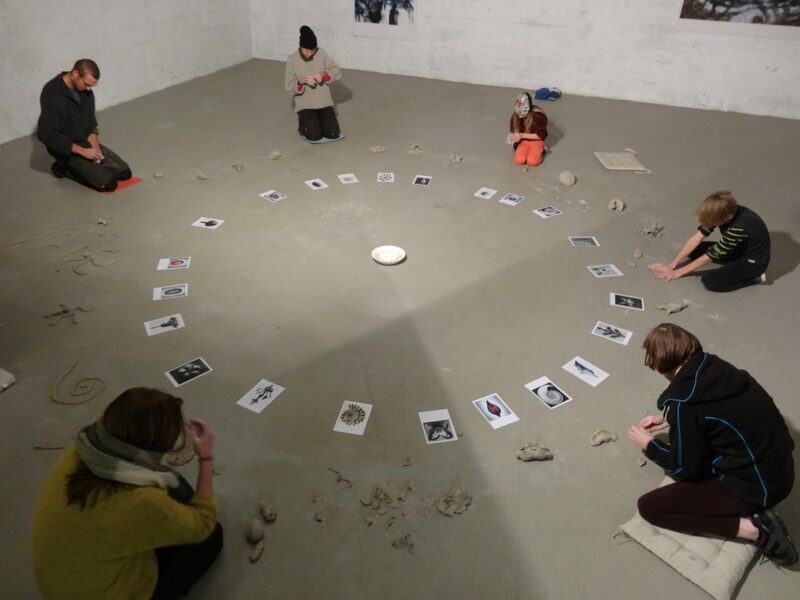 Nov.: Facilitation of a two hour workshop at Norsk Taiji Senter in Oslo, Norway: “Clay and the art and ecology of the human body.” In this workshop participants were guided in making a mini-version of their own seated body with their eyes closed.